Today we honor our founding mothers! Hear Astraea founding mother Achebe Powell and Astraea’s first Executive Director Katherine Acey share what it took to make their vision of a foundation that left no one behind a reality. More than 40 years ago, a small group of women came together to address the needs of lesbians, women of color, and grassroots feminist organizations. They prioritized inclusivity and worked tirelessly over the years to ensure that they were leaving no one behind. We recognize the formidable legacy of our founding mothers. Four decades later, and their vision still burns bright! Thank you, Stella Alvo, Audrey Barnes, Nancy Dean (d), Barbara Grant, Joyce Hunter, Roberta Kosse, Cynthia Long, Achebe Powell, Joan Watts and Leslie Kanes Weisman. 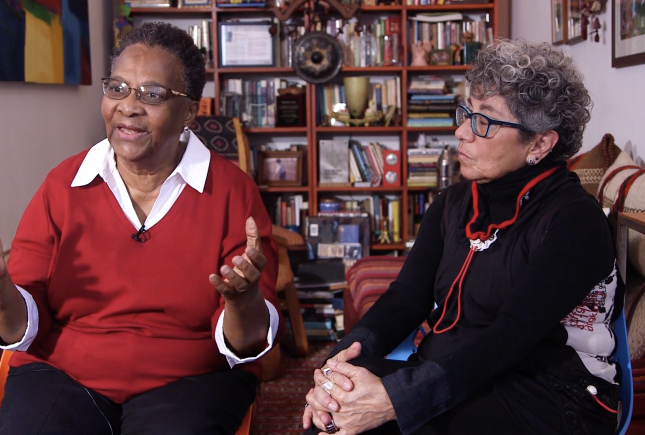 In the video above, hear Astraea founding mother Achebe Powell and Astraea’s first Executive Director Katherine Acey share what it took to make that vision a reality.